7 p.m.; and Sunday from 10 a.m. to 5 p.m.
NEW this year is a large Kayak Demo & Casting Pond for special demonstrations including Introduction to Kayak Fishing by Three Belles Outfitters and 247 Lures; and Float & Fly Techniques by fishing guide and bait designer T.J. DeFelice. 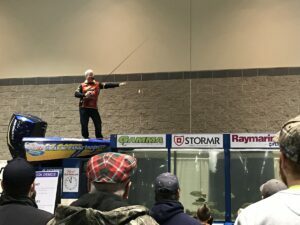 Returning are the popular 5,000-gallon Hawg Trough Bass-Filled Tank where experts will host casting and fishing presentations, and a row of booths where fly-tyers and wooden plug/lure makers will show their skills. 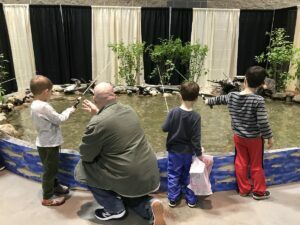 Hands-on activities will include: Live fishing at Catch & Release Trout Pond for prizes; a Black Hawk virtual fishing fighting chair simulator, NRA Laser Shot Range, a Sportsmen’s Outpost’s archery range, Tactical Airsoft CT’s shooting sports; and Connecticut Bass Nation’s Kids’ Casting Competition. 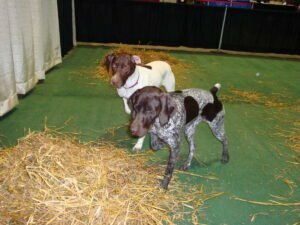 Daily live presentations will include: Training Your “Bird Dog” to Point by Dusty W German Shorthaired Pointers of Palmerton, Pa., and Principles of Duck Hunting by the Connecticut Delta Waterfowl Association. Bully Breed trainers will offer sessions on firearms safety and education. As in past years, fisherman Paul Narducci will give away a range of free fishing items daily. Attendees can meet and schedule tours with charter boat fishing captains including Greg Dubrule, TJ Karbowski, Mike Roy, Mel True, Leo Croisetiere, and Andrew Mazzitelli. Connecticut’s State Department of Energy & Environmental Protection (DEEP) booths will feature mounted fish and animals and a tank of live fish. DEEP experts will provide consumer education on numerous topics and present the latest fishing and hunting rules and regulations. On Saturday, March 30 at 12 noon, DEEP’s Trophy Fish Awards Ceremony will recognize the state’s top anglers. Every day, a U.S. Department of Veterans Affairs’ Mobile VetCenter Bus will be staffed by outreach representatives. Show Admission – cash only: $12 adults; $4 Children 5 to 12; Free under age 5. Saturday, March 30 is Veterans Appreciation Day and the first 200 veterans in line get in free with military/veterans ID. Also on Saturday, the first 200 children in line receive a Kids Cane Pole and Texas Roadhouse meal. Sponsors include: Coalition of Connecticut Sportsmen; The Fisherman Magazine; Renewals by Anderson; VA Healthcare; Hummingbird; Country 92.5 WWYZ; WFSB Channel 3; Bedard Enterprises; and North East Expos; Inc.
► FOR INFORMATION, visit www.fishinghuntingshow.com or call North East Expos at 860-844-8461.